The great tomato, symbol of Italian cuisine, staple of many Mexican dishes, and a perfect condiment for a burger, originated in Peru. The tomato’s global presence is undeniable, as is its adaptability to local recipes. Yet in its journey across the world, the tomato has lived under many names and endured false accusations. No one knows exactly how the tomato moved from Peru to Mexico, but Spanish Conquistador Hernan Cortez was said to have brought it to Spain in the 1520’s. From Spain, the tomato moved to Italy and France. It was known variably as the “pomme dei moro,” Moor’s apple in Spain; “pomi d’oro,” golden apple in Italy; and “pomme d’amour,” love apple in French. The English name is closest to the original Aztec name of tomatl. Despite Southern Europeans’ initial acceptance of the tomato, Northerners were hesitant to try the fruit, assuming it was hazardous because it belongs to the same family as the poisonous nightshade and mandrake. The English knew that “love apples” were being eaten in France, but still thought of them as having an unpleasant odor and taste. Poor relations between England and France may have also influenced British resistance to the tomato. The savory tomato soon won over the holdouts. 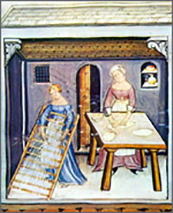 By the end of the 17th century, tomatoes were first mentioned in a cookbook from Naples, and by the mid-18th century, tomato recipes were prepared in British kitchens. Meanwhile, tomatoes sailed with the colonists across the Atlantic to North America, but there were planted for purposes of decoration than food preparation. Although Thomas Jefferson ate tomatoes for dinner and people in New Orleans enjoyed tomatoes as early as 1802, it was not until the 1820’s that tomatoes were consumed in any great amount in the United States. With the advent of canning, tomato consumption steadily increased in the late 1800’s. And thanks to the enterprising Joseph Campbell and his soup, tomato production started to soar in the 1920’s. And then there was ketchup, with origins far from Peru or the US company Heinz. In the 1600’s British sailors on shore leave in China were treated to a local delicacy known as kachiap or ketsiap. Used as a dipping sauce, “kachiap” was made from the brine and spices used to pickle fish. The British soon adopted and reformulated this sauce. The first British recipe for ketchup appeared in the early 1700’s and included anchovies, shallots, vinegar, white wine, cloves, ginger, mace, nutmeg, pepper and lemon peel. In the early 1800’s an American in Nova Scotia, James Mease, published the first recipe for ketchup made with tomatoes. By 1830, tomato ketchup sold across the United States. In 1872, when H.J. Heinz added tomato ketchup to his products, production took off. 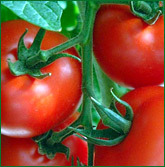 The United States, China, Turkey, Italy and India are the top five tomato producing countries. Production in China has gone from 14 million metric tons in 1996 to 17 million metric tons in 2000. Consumption has also increased - in 2000 13.5 kilograms per capita was consumed. The discovery of high concentrations of lycopene, a cancer-fighting compound, in tomatoes has made them prized for their health benefits. The tomato has become so prevalent because of its taste and versatility. It has adapted itself to each cuisine with ease - pasta accompanied by pomidoro sauce or insalata caprese, tomatoes and mozzarella; rogan josh, a type of curry, or sambar, a type of lentil soup; or pizza and salsa. Imagne if these dishes did not have tomatoes? Add ketchup to the list, and one sees how different the world would be if the tomato had not left Peru. Nils Bertil-Wallin is a Yale University student.